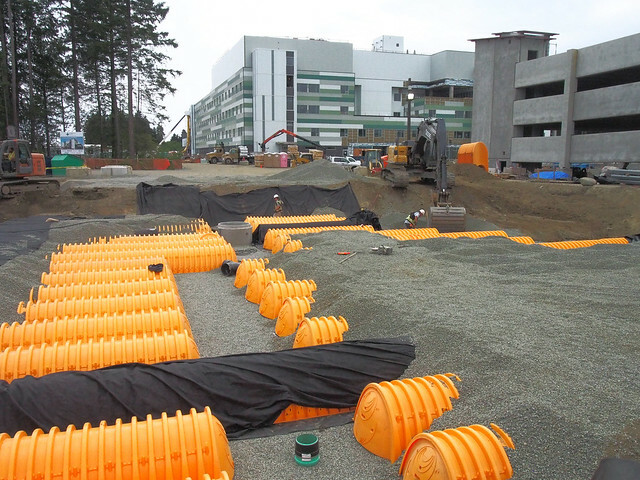 Manufactured by Advanced Drainage Systems (ADS), the orange shells are designed to be a cost-effective method to save valuable land while protecting and managing water resources. They’re also lightweight and stackable to reduce transportation costs and related carbon emissions. The northeast excavation was filled with 230 shells, which were then buried, creating a 500-cubic-metre underground chamber. An even larger excavation last fall between the hospital and Lerwick Road, used 330 arches to create a 1,750-cubic-metre underground chamber, for a total on-site capacity of 2,250 cubic metres. That’s 2.25 million litres, or 495,000 gallons! Each of the two chambers acts as a large subsurface holding pond collecting storm water from the hospital site. The shells are open-bottomed and set on a permeable surface so water can filter back into the ground via the Quadra Sands geography in the area. The water can also be filtered and discharged via flow controls into the city storm sewer system so as not to overwhelm the city storm sewer system during heavy rainfall events. The system is designed to handle a 100-year rainfall event.